This story was read aloud at Story Salon (.com). I was walking with my camera, as I do. It was mid-October 2009, and I was in Southern England, specifically in a city called Exeter, a beautiful city with a cathedral, thousand year old city walls and a university. After taking a few pictures of the small lanes crookedly leading out from the high street I came across a small square park. It was just an empty grass field, with a few gnarled trees and a surrounding knee high stone-wall. There was a man in the field, and a young lady wearing a school uniform who looked to be in her early teens. The man was probably in his mid-50’s and was shirtless. 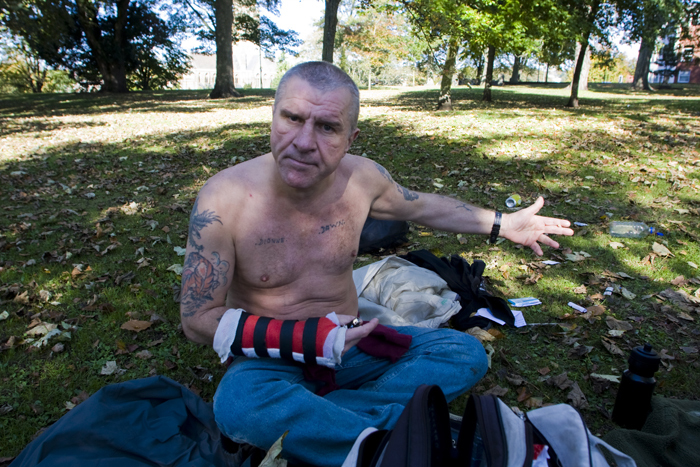 His hair was cropped to the scalp, his right arm was in a forearm cast and he had tattoos. He moved like he was drunk, he must have breakfasted on beer as it was only just noon. He swayed back and forth, and rose on his tiptoes as he lent forward to say something to the girl, like he wanted to tower over her even more, then he would slightly lose his balance, and sway back on his heels. The girl was standing strong, but I could tell she was intimidated. Her posture was upright and stiff, trying to look relaxed. I couldn’t hear what they were saying, but she obviously kept saying that she needed to go, as she kept making leaving motions with her shoulders, but he wouldn’t let her, not physically, but verbally. He kept asking her questions, and saying that he had important things to say. I entered the park, to assure that nothing strange was going to happen, and walked vaguely near the odd couple, holding up my camera to take pictures. The man noticed me, which gave the girl an out, and she left the park. He came up to me. The first thing he said was, “I just got out of prison this morning.” And I could smell the beer as he put his face just a little to close for polite conversation. He waved a piece of paper around in his left hand, and announced to me and the empty park, that he was the first person to be put in prison for Antisocial Behaviour in Cornwell. He saw the doubt in my eyes, and pushed the paper in front of my face, there was just time see to an official government stamp, the words Antisocial Behaviour in large letters, and the word release. But he had misunderstood the doubt in my eyes, I definitely didn’t doubt that he had been in prison for Antisocial Behaviour, but that he was the first in Cornwell to be put in prison for to Antisocial Behaviour. Nothing against the Cornish, fabulous people. He shoved out his right hand, with the four fingers wiggling out from the cast that ended at his knuckles, so I shook his fingers and noticed that he had ‘love’ tattooed on the knuckles, and sure enough ‘hate’ on the other hand. He told me his name was Gary Cooper, and didn’t make any mention of the actor, so I kept my mouth shut as well. He asked me, while he kept his feet perfectly planted but his upper body moved in rocking motions, if I was a writer, because he had a life story that would make a great book. Before I could answer, he told me again that his life was a great story. I said I was only a photographer, and he looked at the camera, said it was a nice camera, in a way that made me suspicious, and said it was a shame because we could’ve make lots of money from his life story. Mr. Cooper said that he liked me, and invited me over for a beer. He sat down on the grass, surrounded by his backpack and assorted possessions, and pulled out a can of larger, one of the strong cheap ones. I turned down his offer for a beer, and then he told me he liked me again, that he was a good judge of character, and I was a good person, he wanted to give me something because I was such a good person. I was crouched on my feet, ready to spring away, because he gave of a feeling of menace, like at one moment he announces that he likes you, and the next his mind twists from something innocuous you said, and decides it would be better to hit you. He pulled something out of his pocket, and held it out for me. It was a lighter. A simple black disposable lighter. I said that I didn’t need a lighter, but he insisted, over and over again that I was good, and that he liked me. I didn’t want to take the lighter, I didn’t want to owe him anything, so I said that we would trade, and I pulled my black plastic lighter and we traded. Then I looked at the lighter, it said “H.M. Prisons Only.” Or Her Majesty’s Prisons Only. My mind lit up, this is a great souvenir. 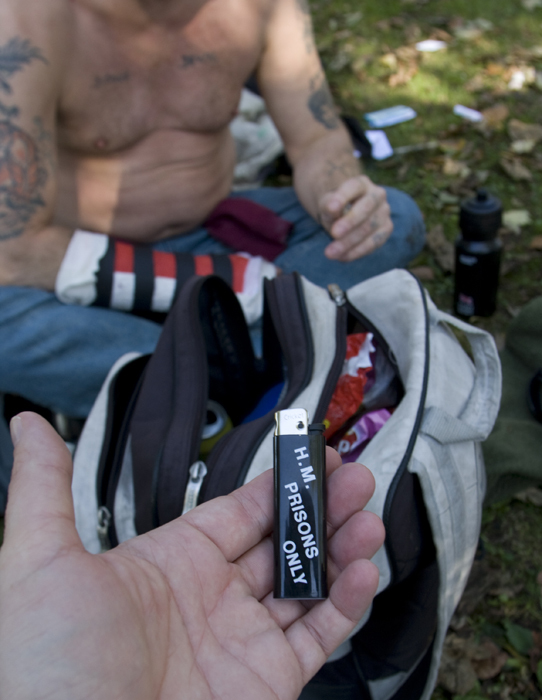 I thanked him profoundly for the lighter, and after a few moments said I had to leave. He stood up with me, and held out his hand for me to shake his fingers again. Mr. Cooper told me again what a great person I was, and then his mind wandered to something else as he talked at me, and I let him for a few more minutes, and finally I told Mr. Cooper that I had to leave. And he put out his hand for me to shake it one more time, and after the shake, I left. But after a few steps he called out to me. I stopped and turned around, afraid of what he was going to say. On that, I left the park.